Well British Pie Week 2017 has truly begun – so what more motivation do you need?! Grab a pie, make a pie, tweet your #PiePledge. Over 7,000 of you have already read our article "Everything you need to know about British Pie Week" and we're delighted to have launched the new British Pie Week logo too! Tomorrow we'll be at the British Pie Awards 2017 which are once again taking place in British Pie Week! We'll be there as media to cover the event, alongside our Com-pie-tition winners as judges! But as for today, we're getting ready for the Pie Awards and going to be posting about our Pie Night last night later! Oh and we'll eat a pie or two, of course! Not that you'd be sur-pie-sed about that from the new home of British Pie Week!!! So whatever you get up to today, go crazy for pie this British Pie Week! Enjoy! You may have already spotted if you read the Independent online that our Birmingham Pie Night made the list for "The best five places to celebrate across the country" this British Pie Week! 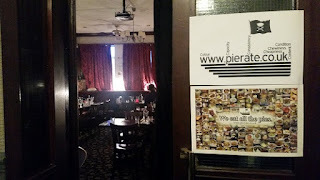 We really enjoyed the pies that the Jekyll n Hyde provided on Monday evening and will be posting about our Pierate Pie Night later tonight! - Organise a pie night - which is what happened on Monday evening in Birmingham! As for today, I once again woke up listening to Chris Evans talking pie on BBC Radio 2 (this seems to be becoming a running trend!) and I have to admit to being slightly jealous of all these pies Chris keeps talking about and eating on air, even if it is early in the morning!!! The big event of day one was our Birmingham Pie Night, which kicked off after work at 5:30pm! We were wonderfully hosted by Jekyll and Hyde and loved sharing some stories of pie rating with our guests - alongside eating some top pies! More pics and a review to follow tonight, before we get ready for the British Pie Awards tomorrow, where we will be live blogging! My pie pledge pies for Day Two were two Mr Kipling Apple and Blackcurrant pies with evaporated milk! One of my pie pledges was to eat a pie a day, and I'm not going to fail on Day Two! Today I went for a previously-unreviewed Pieminister Chilli con Carnage pie. It did claim to be hot - made with real scotch bonnets - and my word it was hot! This is not one for the faint hearted. The review will be coming shortly, and it will be a scorcher.